The Dobermann breed is named after Louis Dobermann, a German policeman and dog-catcher. By selectively mating dogs whose qualities he admired, Dobermann produced a breed that made an excellent guard and companion dog to help him carry out his police duties. They were registered as a breed in 1890. Leon & Ria Potgieter, Cell: 0638000558, Landline 00268-76031744 & 76555110 Email: leoria.kennel@gmail.com, Webpage Leoria. 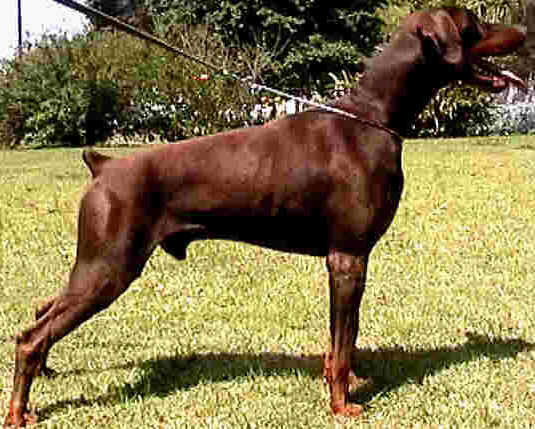 Dobermanns are strong and energetic dogs, requiring firm handling and training while young. They can be aggressive with other dogs, and people, so they make excellent watch dogs. Care must be taken to teach children not to provoke the dog. Dobermanns have a short, tough smooth coat that requires little grooming. Height at shoulder: males 68 - 72 cms, females 63 - 68 cms. Colour: the only two colours allowed by KUSA are black & tan, and brown & tan. Any other colour (blue, fawn, albino) are not allowed by KUSA. Ears can be cropped (cut) to make them stand up, or they can be left natural. The tail can be cut off to make it look like a stub, or it can be left intact. 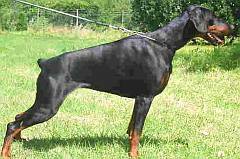 If you're buying a Dobermann puppy, you can ask the breeder not to amputate the puppy's tail. Class: Working. Some people call the dogs "pinschers", meaning terrier, but the Dobermann is not a terrier, he is a working dog bred to do a job of work - namely to guard his master and property. Dogs are normally enthusiastic about whatever they do. If they are guarding the property, they do it whole-heartedly, running up and down the fence to intimidate any intruder. Let's you and I be whole-hearted in our tasks! The Bible says, "Whatever your hand finds to do, do it with your might!" Ecclesiastes 9, 10. KUSA registered Dobermanns will have been tested for Hip Dysplasia in order for the puppies to be registered, however other hereditary health conditions that Dobermanns can display are vWD (a bleeding disorder), DCM (heart disese) and PHPV (abnormality of the eye). Do ask the breeder if the mum and dad have been tested these conditions, and ask to see the results of the tests if you are unsure.